Let me just say how sorry I am this happened. Robin Williams was my all time favorite comedian. My full name is Marcus Gesundheit, and when I was younger I was pretty ill. At age 5 my asthma was so bad that I had to be put on oxygen, and had to skip school. I was diagnosed with Celiac disease at age 7, and Crohn's disease at age 9. I was in chronic abdominal pain, I was (and still am) on all types of pills and injectables, I was often anemic and too tired to play any kind of sports or ride my bike. I also had a distended belly much like a malnourished child in africa. 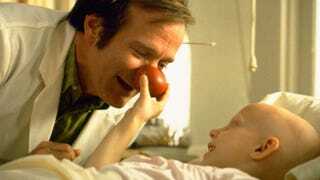 Watching Robin in Patch Adams not only made me feel better about being sick all the time, but made me less self conscious about having Gesundheit for a last name. I mean if there was an institute named Gesundheit, why should I be embarrassed? Robin Williams was a good man and will be greatly missed.